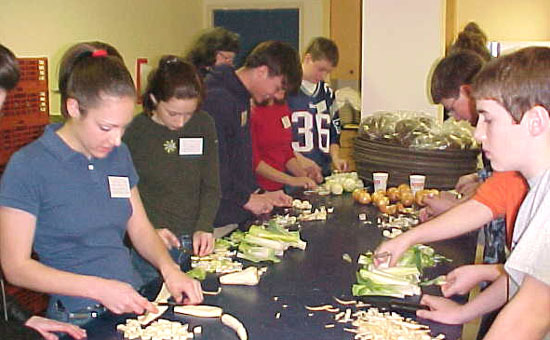 Students chop vegetables for a Moldovan vegetable soup. On Monday, March 26, sixth, seventh, and eighth graders from central and coastal Maine came to Colby College to learn about Russia's history, language, and culture. Entitled "A Russian Sampler," the program is now in its ninth year. With 232 participants, this year's attendance was the largest ever. The students came from schools in Waterville, Winslow, Oakland, China, Vassalboro, Free­port, Newport, Augusta, Damaris­cotta, Winthrop, Jay, Readfield, Thorndike, Union, and Litchfield. In all, over forty workshops and presen­ta­tions were offered on some twenty different topics. 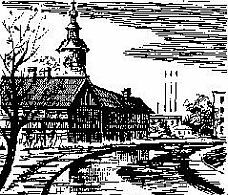 Members of the Kotlas Connection, college students, and other area Russophiles taught the classes. The students decorated Ukrainian Easter eggs, carved stenciled designs into birch bark, painted clay animals, listened to Russian fairy tales, made Russian cookies and soup, learned to say and spell their names in Russian, looked at Russian stamps and icons, learned about the rise and fall of Communism, visited Russian web sites, saw pictures from a Russian wedding, and met college exchange students from Russia, Ukraine, Armenia, and Belarus. Most sessions were offered more than once, allowing students ample opportunity to learn about their favorite topic. 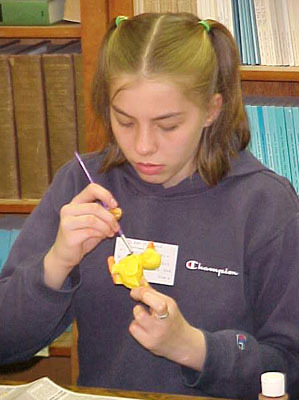 A girl carefully paints a clay duck. Student evaluations of the day were overwhelmingly favorable. Here are a few of their comments: "I learned that some churches have "onions" on the top . . ." "I found out that it is awful bad luck for a bride to show anyone her dress before the ceremony." "The exchange students were real and awesome and I loved their accents." A boy from Winslow summed up the experience best, writing "I loved the Russian Sampler and would recommend it to anyone. It is a fun way to learn about Russia and its culture." 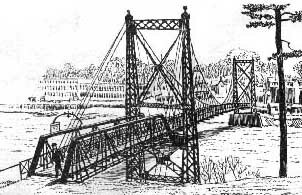 A Russian Sampler was cosponsored by the Kotlas Connection and Colby Russian Program. It was organized by Mary Coombs, a Kotlas Connection board member and teacher of the gifted and talented at Winslow Junior High School, and by Sheila McCarthy, a professor of Russian at Colby.